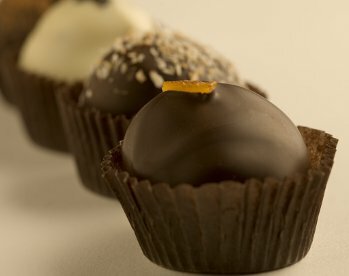 Our focus on local and organic ingredients creates the most tasty truffles. The "twist on traditional" confections are silky-smooth on the inside, with a thin crunchy chocolate shell on the outside. They are hand-dipped for an elegant, yet handmade look. We'll include a mix of our classic and seasonal flavors, to keep you excited. Our beautiful fair-trade boxes make a fun and eco-friendly gift, or a special treat for yourself. We start with browning butter 'til nutty and golden, then add an extra pinch of sea salt along with milk and semisweet chocolates. 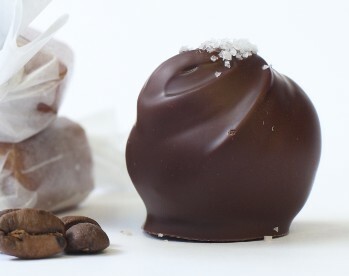 A garnish of fleur de sel completes this truffle that is decadent in its simplicity. Seasonal. 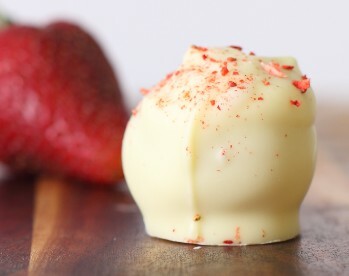 White chocolate, market strawberries, 18-year aged balsamic. A classic combination that everyone should try. The sweetness of the strawberries and white chocolate is perfectly balanced by the acidic yet complex sweetness of the balsamic. We say it tastes like strawberry ice cream. Available until June 30. 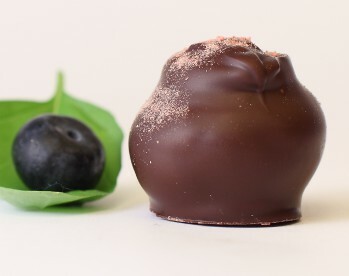 Semisweet and bittersweet chocolates with farmers market blueberries, pomegranate juice, and cream infused with our own homegrown basil. Very complex and fun, the flavors will work in layers: first you'll taste dark chocolate and a subtle licorice note from the basil, then the fruit follows up. One of our favorites, and seasonal. 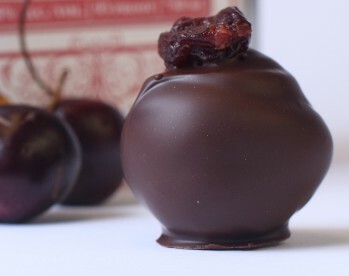 Tart cherries from Michigan, FEW bourbon (distilled in Evanston), and a touch of bitters mixed with bittersweet chocolate creates the perfect Manhattan cocktail in truffle form. Goat cheese and chocolate together are delicious. You might think we're crazy, but think about it for a second. We've all had goat cheese with a touch of something sweet, like honey, apricots, or pears. 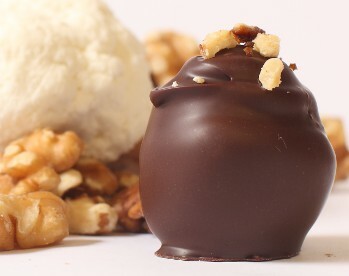 We took that classic pairing and added chocolate and crunchy candied walnuts. One of our best sellers. White chocolate with fresh squeezed lemon juice / zest + and a hefty dose of poppyseeds. We fell in love with this truffle simply because it tastes like the best lemon poppyseed cookie batter. Chocolate, caramel, and coffee. What could go wrong? Milk and semisweet chocolate are the perfect base for our soft honey caramel. Cream infused with locally roasted coffee from Ipsento is blended in to the ganache, then the truffle is dipped in milk chocolate. 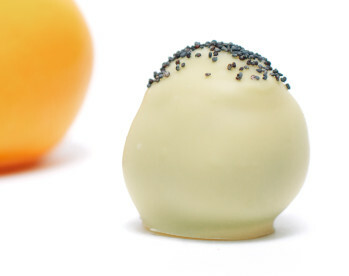 Tangy passionfruit and zesty fresh ginger are perfect to temper the sweetness of white chocolate. A garnish of pink peppercorn adds some extra zip. 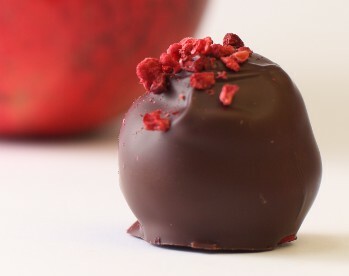 This truffle is fruity, tart, sweet, and spicy all at once: it's a party in your mouth! Our favorite Kilgus cream is infused with Ipsento's coffee (roasted only 4 blocks away!) and mixed with bittersweet chocolate. A dash of vanilla and a whole coffee bean garnish result in a super intense, powerful Java truffle reminiscent of the best mocha you've ever had. Great for late-night plots, studying for a final, or baby sleep training. acao bittersweet chocolate to create the perfect winter truffle. 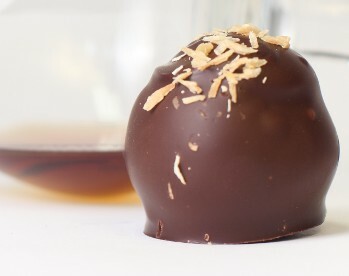 Cherry and raisin notes of our rum as well as the subtle flavor and texture of toasted coconut make this truffle rich and complex. And can we say that this is the perfect truffle "for the guys?" Oil of peppermint and Crème de Menthe liqueur are combined with milk and semisweet chocolate for an intense minty flavor and aroma. 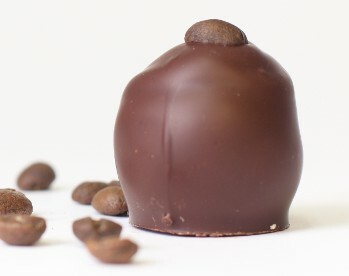 A thin shell of bittersweet chocolate contrasts the smooth, silky inside. 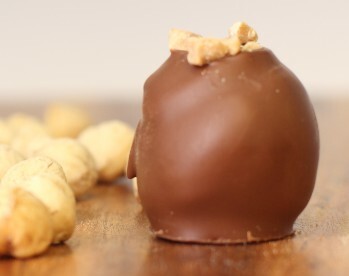 One of our more classic truffles. 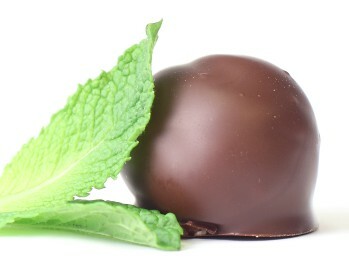 % cacao semisweet chocolate for a refreshing, summery truffle. 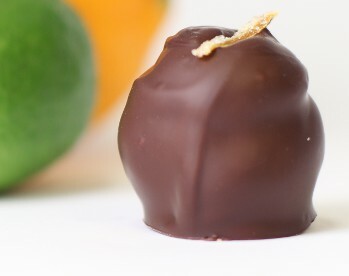 A garnish of homemade candied orange peel makes this perfect for summer sweets tables. Our most popular truffle to pair with champagne. Milk and semisweet chocolates are blended with freshly toasted ground hazelnuts and hazelnut paste. 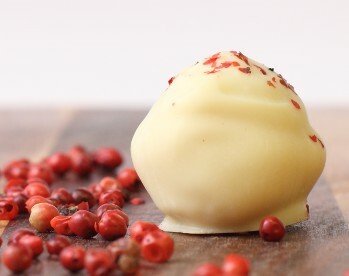 White pepper adds a subtle kick, and a flourish of hand-chopped hazelnuts adorn the milk chocolate shell. Pair this with a locally brewed porter, or rock it out by itself.